Born in Havana, Moro studied dance at the Academia Nacional de Narciso Medina, and performed with many prestigious Cuban Dance Companies. He specialises in Afro-Cuban Dance, Rumba, Mambo, Cha Cha Cha, Son, Salsa and Dominican Bachata. In 2004, Moro established Buena Vista Dance, to teach Cuban Dance and promote Cuban culture in Australia. In 2009, Buena Vista Dance won the National Cubamemucho Salsa Rueda Competition in Melbourne, in which Moro choreographed, directed and performed. The group went on to represent Australia at the Cubamemucho 2010 World Rueda Championships in Munich, where they placed third. In 2009, 2010 and 2012 he and his partner won the Australian Bachata Championship. We can’t wait for Moro to share his vast experience and knowledge with us! Price from 13th October: $25 per workshop or all 5 for $115. Saturday: Polish Hall, 22-24 Main Road Newtown. Entry via doorway on Main Rd. Limited parking available via Clare Street. BOOK AND PAY TO SECURE YOUR PLACE. Refunds will be issued if class size is exceeded (sorry to those who miss out). And Email: Send email to “makrina_t@hotmail.com” indicating which classes you have paid for. • There will be NO DOOR SALES this helps us to reduce administration on the day. • If you CANNOT MAKE A CLASS, then please let us know as early as you can, as we may be able to find a replacement (there will likely be someone missing out who would love to take your place). Please feel free to contact me via messenger or at makrina_t@hotmail.com if you have any questions. Time to let loose and have a bit of fun with some new turn patterns. Learn to move those feet, with a lesson in authentic Dominican style bachata. A predecessor to salsa, this Cuban dance is pure elegance with its contratiempo timing. Unique to Cuba, Rumba is a meld of African rhythms and flamenco influences. Elements of rumba are commonly integrated into Cuban salsa. This workshop will help you to integrate snippets of rumba into your salsa dancing. Wednesdays 7.30-9pm 21st March – 11th April inclusive. To register complete the form here. Dominican Bachata workshop registrations are now open, and spots are filling up fast! Earlybird price $50 until 18th June, $60 thereafter. Registrations close 30th June. To register, fill out the google form here. Here we go again folks. Moro will be returning this February for a weekend of workshops. 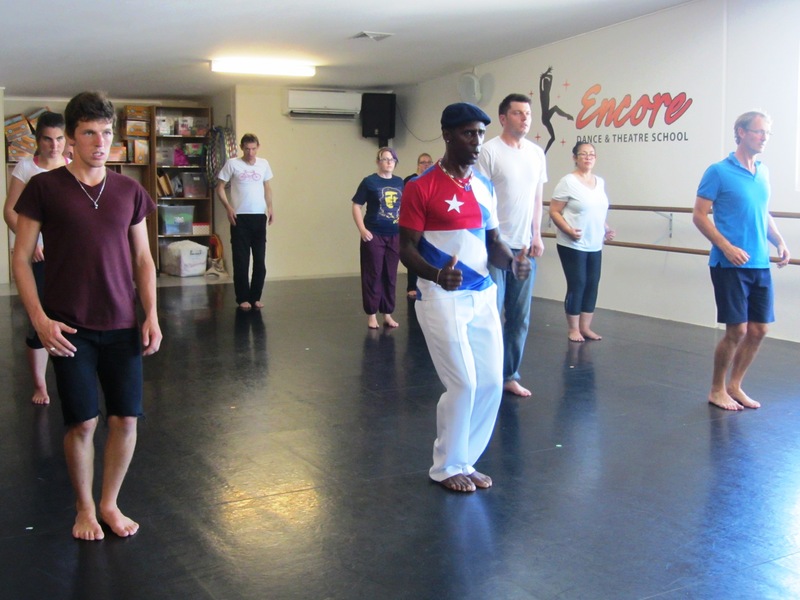 Classes will cover Cuban, Afro and Dominican styles of dance. This is a weekend you don’t want to miss! Born in Havana, Moro studied dance at the Academia Nacional de Narisco Medina, and performed with many prestigious Cuban Dance Companies. He was first solo dancer and choreographer with “Havana Nights”. Moro has worked as a dance teacher in Oslo, Stockholm and throughout Australia. He specialises in Afro-Cuban Dance, Rumba, Mambo, Cha Cha Cha, Son, Salsa and Dominican Bachata. 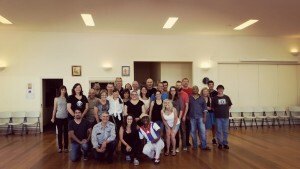 In 2004, Moro established Buena Vista Dance, to teach Cuban Dance and promote Cuban culture in Australia and since then has also founded the Australian Rueda de Casino Championships. Price from 30th January: $25 per workshop or all 5 for $110. Saturday: Ukrainian Hall, 185 Main Road Moonah (opposite MacDonald’s). Parking is limited at the location. Where: The Founders Room, Wooby’s Lane, Salamanca. When: Three hours of dancing goodness, kicking off at 9pm. Send email to “makrina_t@hotmail.com” indicating which classes you have paid for. • DRINKS: BYO. NO GLASS (glasses or glass bottles) allowed in the room as this is a condition of use when hiring the studio. • If you CANNOT MAKE A CLASS, then please let us know as early as you can as we may be able to find a replacement (there will likely be someone missing out who would love to take your place). Danced on the off-beat. Son is one of the traditional partner dances that salsa evolved from with a beautiful and elegant style. Unique to Cuba, Rumba is a meld of African rhythms and flamenco influences. Elements of rumba are commonly integrated into Cuban salsa. This workshop will help you to ground yourself to the beat of the music and develop your body movements. Afro-Cuban dancing that represents each of the Orishas. Learn different movements that help to unlock the body, and develop your musicality. Time permitting – we will work on how we can add elements of these dances into our salsa. Born in Havana, Cuba, Moro studied dance at the Academia Nacional de Narisco Medina, and performed with many prestigious Cuban Dance Companies. He was first solo dancer and choreographer with “Havana Nights”, one of the largest independently produced shows ever to leave Cuba, touring extensively throughout Mexico, Central Europe, Scandinavia, Japan and Australia. Moro has worked as a dance teacher in Oslo, Stockholm and throughout Australia. He specialises in Afro-Cuban Dance, Rumba, Mambo, Cha Cha Cha, Son, Salsa and Dominican Bachata. In 2004, Moro established Buena Vista Dance, to teach Cuban Dance and promote Cuban culture in Australia. He has choreographed and performed in various shows, including Cuban Folkloric Company, World Salsa Congress, Afro-Cuban Express, and NZ Pacific Salsa Congress. In 2009, Buena Vista Dance won the National Cubamemucho Salsa Rueda Competition in Melbourne, in which Moro choreographed, directed and performed. The group went on to represent Australia at the Cubamemucho 2010 World Rueda Championships in Munich, where they placed third. In 2009, 2010 and 2012 he and his partner won the Australian Bachata Championship. $25 per workshop or all 3 for $65. Ukrainian Hall, 185 Main Road Moonah (opposite MacDonald’s). Parking is limited at the location. Where: The Italian Club, Federal Street, North Hobart. When: FREE 30min rueda de casino class with Moro at 8:30 pm and then dancing until 11:30pm. There will be NO DOOR SALES this helps us to reduce administration on the day. We are very lucky to be hosting one of Australia’s leading Cuban instructors next February for a weekend of workshops. Moro will be covering Cuban, Afro and Dominican styles of dance. This is a weekend you don’t want to miss! 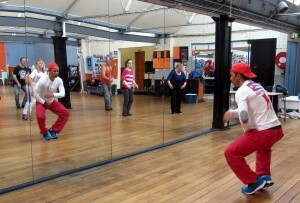 In 2004, Moro established Buena Vista Dance, to teach Cuban Dance and promote Cuban culture in Australia. He has choreographed and performed in various shows, including Cuban Folkloric Company, World Salsa Congress, Afro-Cuban Express, and NZ Pacific Salsa Congress. In 2009, Buena Vista Dance won the National Cubamemucho Salsa Rueda Competition in Melbourne, in which Moro choreographed, directed and performed. The group went on to represent Australia at the Cubamemucho 2010 World Rueda Championships in Munich, where they placed third. In 2009, 2010 and 2012 he and his partner won the Australian Bachata Championship. In 2013, Moro founded the Australian Rueda de Casino Championships. Early Bird Price: $20 per workshop or all 5 for $90. Price from 29th January: $25 per workshop or all 5 for $110. Send email to “john.holtzclaw@education.tas.gov.au” indicating which classes you have paid for. • SHOES: It is a proper dance floor so please wear proper dance shoes or shoes with soft soles (suede or leather), no hard plastic. Originating from the Bantu culture, Palo is characterised by fast, energetic and fighting motions. It is usually performed with sticks or poles and there is a constant movement of shoulders, chest and torso. Makuta is a cheeky, social dance originating from Congo & brought to Cuba through Haiti. Born in Santiago de Cuba, Israel has been dancing practically all of his life. He first went to a specialised dance school at the age of 11 and went on to graduate from the National School of Art in Havana. Upon graduating, he worked for 2 different modern dance companies in Cuba before winning a position in the dance spectacular ‘Havana Night’. He travelled the world with this company, performing in more than 9 countries throughout Asia and Europe, before settling in Australia in 2003. Israel then went on to establish Cuban Dance Company in January 2004, through which he shares the passion, energy and creativity that defines Cuban dance and music. Join us for what is sure to be another great weekend this August with Cuban instructor, Israel Ortiz!! Price from 27th July: $25 per workshop or all 5 for $110. Book and pay to secure your place! Refunds will be issued if class size is exceeded. • DRINKS: BYO water bottles. No glass (or glass bottles) allowed in the room as this is a condition of use when hiring the studio. • If you CANNOT MAKE A CLASS then please let us know as early as you can as we may be able to find a replacement (there will likely be someone missing out who would love to take your place). • SHOES: It is a proper dance floor so please wear proper dance shoes or shoes with soft soles (suede or leather). Book and get your tickets! Professional dancer, instructor and choreographer, Adrian Medina was born in Havana, Cuba and was trained at the most elite dance companies in Cuba including the Narciso Medina Dance School and the world famous Tropicana Musical and Dance School where he received degrees in Modern, Contemporary and Afro-Cuban dance. 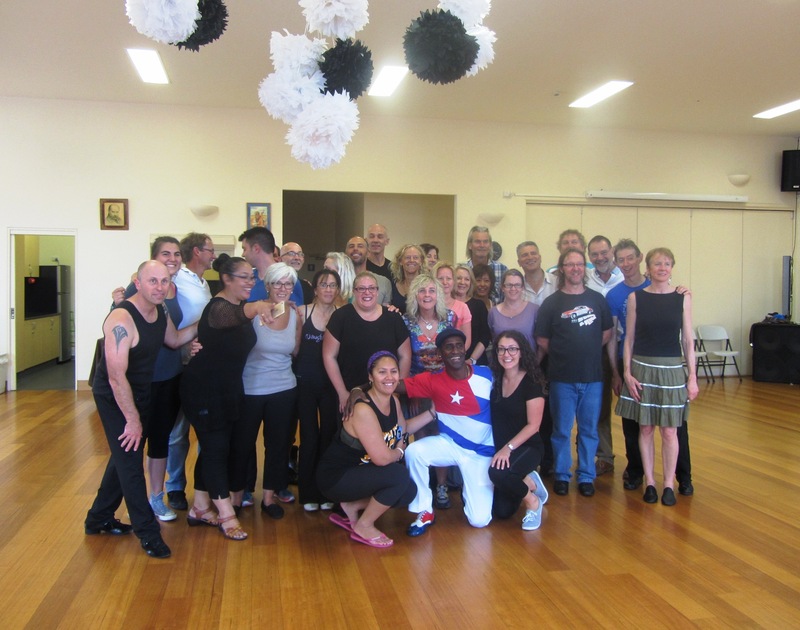 Having performed with the Australian Opera, worked as a performance lecturer at the Adelaide Institute of TAFE and participated at the biggest Latin dance events in Australia, New Zealand and Asia, Adrian is truly a master of Cuban dance. We are extremely excited to have Adrian share his knowledge and energy with us! Learn how to dance like they do in Cuba! This workshop will teach you how to break away from just doing turn pattern after turn pattern and add a bit of Cuban flavour to your dancing. Time to learn some fun new turn patterns! One of the traditional partner dances that salsa evolved from with a beautiful and elegant style. Afro-Cuban dancing that represents each of the Orishas. Learn different movements that help to unlock the body and gain coordination, and musicality. Non-partnered salsa class incorporating all forms of Cuban dance styles (e.g. son, cha-cha, afro etc). Guaranteed to make you sweat! Early Bird Price: $20 per workshop or all 6 for $110. Price from 6th April: $25 per workshop or all 6 for $130. Saturday: John Colvin Stand on the Cenotaph (Hobart Regatta grounds). You turn off the highway, follow the road (last bit on foot for the less adventurous) to the end where you will find a grand stand (John Colvin Stand) and enter the building from the front – the dance studio is in and to your left. Sunday: Phoenix Danze Studio, at the back of city hall. Please use side entrance on Campbell St and come up the stairs. Saturday Night Party: 8:30-11:30pm at Wesley Hall (56-58 Melville St). Entry $10. BYO drinks. – There will be NO DOOR SALES this helps us to reduce administration on the day. – DRINKS: BYO. NO GLASS (glasses or glass bottles) allowed in the room as this is a condition of use when hiring the studio. – If you CANNOT MAKE A CLASS then please let us know as early as you can as we may be able to find a replacement (there will likely be someone missing out who would love to take your place). – SHOES: Please wear proper dance shoes or shoes with soft soles (suede or leather). Our lovely cuban dancing compatriots from Hobart (Nick and Pip) will be joining us to provide a 1 hour introduction to rueda class and two 90 minute classes followed by social dancing in the evening . **note Nick will be hiring a mini-bus to take people up and back the next day. C: Intermediate Rueda: 2.45 – 4.15pm. (Include in the description name and class and send Michelle an Email on salsame@outlook.com) Call Michelle on 0408712751 for further details.